Happy and effusive, Jamsheed Bhote is instantaneously likeable. Quite like the nutmeg flavoured lagan nu custard that he has prepared for the food festival showcasing Parsi cuisine. “It’s a must at our weddings, but a bread butter pudding or caramel custard is a staple dessert at a regular Parsi meal. We are Brits, Iranians, Gujaratis and Bombaywallahs all rolled into one,” he says about the different influences that have shaped Parsi food and habits. With pride Jamsheed narrates the tales of his community’s migration to India and the culinary journey. He talks of the four boats that brought his ancestors down to the Rann of Kutch, of the initial hesitation of the ‘Rana’, the ruler there and of the Parsi head priest’s appeal for shelter. It is said that the priest asked for two bowls, one of milk and one of sugar and mixed them. The Rana was then asked to extract the sugar from the mix, which he could not. That, pointed out the priest, would be the degree to which the settlers would merge with the indigenous community. And so it was. The “khatta meeta”, sweet-sour tang, is a Gujarati influence. “Sugar is added either for a first taste or for an aftertaste, but sugar is used in most dishes,” says Jamsheed, who was training in-house chefs at The Trident for the festival that runs through this month. Parsi food derives its penchant for meats–lamb and poultry–from Iran, but seafood and fish are a coastal influence. “We brought our temple fire carefully over the seas when we migrated and built our first temple at Udwada in Gujarat. We imbibed Gujarati food habits. This was followed by Western influence from the British and the cuisine, which was initially quite tangy, but gradually turned mild. Crumb frying and baking techniques were introduced, bringing in some of the most popular dishes like frilly cutlets and lagan nu custard. For the festival Jamsheed has crafted a true-blue Parsi menu tailoring it to the contemporary dining style and displaying all the different culinary influences. The kofta pulao, rich with nuts, raisins and saffron is an Iranian legacy. The Indianised masala scrambled egg, called akuri is served atop hard bun or pav and is one of the most delectable entrees. Chutney patties carry wholeheartedly the flavour of Mumbai–a crumb fried aloo tikki sandwiches with a sweet-sour mint-coriander chutney. 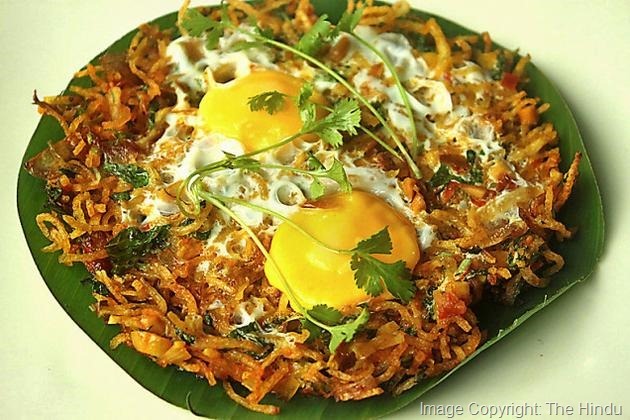 Parsi food is known for dishes with shoe string potatoes (salli). They are fried and served more as an accompaniment and not as a garnish. Par eedu meaning topped with eggs is another Parsi food trait and salliu par eedu is a must-have. The Parsi stew, unlike a conventional stew, is dry, tangy and uses no coconut. It is traditionally served at weddings. Patra Ni Machi is fish steak ( here mahi-mahi) marinated with mint chutney and wrapped in banana leaf and steamed. Apricot mutton or jardaloo ma gos is another must have with its blend of sweet sour richness. It is commonly said that if it is Parsi food it must be dhansak. “Yes, dhansak is a well-known dish but is not feast or wedding food. It is served on the third day after bereavement,” says Jamsheed adding that it is a pureed mash made from three different types of lentils, meats and all the vegetables that are in the kitchen! At the festival dhansak is served with brown rice, basmati browned gently with onions and with a dash of caramelised sugar, served with lemon drizzled kachumbur (onion tomato salad). Though they do not have much for vegetarians,Jamsheed has rustled up some interesting recipes. A Parsi wedding menu is one of the most scrumptious menus to savour. The lagan nu custard, lagan meaning wedding, is rich and almost of a cake consistency. For any other celebration—a birth, a prayer, a get-together—it is the Ravo—the semolina pudding that makes it definitely to the table. White pumpkin is a vegetable the Parsis use generously. They make halwa with it. The doodhi halwa, too is another common Parsi sweet. All three are on the menu to relish. The festival is on for lunch and dinner at The Trident through August.